Emamian, Y., Nakhai, I., Eydi, A. (2018). Simultaneous reduction of emissions (CO2 and CO) and optimization of production routing problem in a closed-loop supply chain. 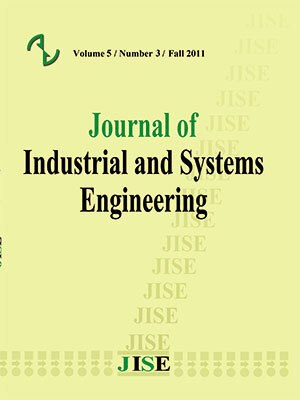 Journal of Industrial and Systems Engineering, 11(2), 114-133. Yasser Emamian; Isa Nakhai; Alireza Eydi. "Simultaneous reduction of emissions (CO2 and CO) and optimization of production routing problem in a closed-loop supply chain". Journal of Industrial and Systems Engineering, 11, 2, 2018, 114-133. Emamian, Y., Nakhai, I., Eydi, A. (2018). 'Simultaneous reduction of emissions (CO2 and CO) and optimization of production routing problem in a closed-loop supply chain', Journal of Industrial and Systems Engineering, 11(2), pp. 114-133. Emamian, Y., Nakhai, I., Eydi, A. Simultaneous reduction of emissions (CO2 and CO) and optimization of production routing problem in a closed-loop supply chain. Journal of Industrial and Systems Engineering, 2018; 11(2): 114-133. Environmental pollution and emissions, along with the increasing production and distribution of goods, have placed the future of humanity at stake. Today, measures such as the extensive reduction in emissions, especially of CO2 and CO, have been emphasized by most researchers as a solution to the problem of environmental protection. This paper sought to explore production routing problem in closed-loop supply chains in order to find a solution to reduce CO2 and CO emissions using the robust optimization technique in the process of product distribution. The uncertainty in some parameters, such as real-world demand, along with heterogeneous goals, compelled us to develop a fuzzy robust multi-objective model. Given the high complexity of the problem, metaheuristic methods were proposed for solving the model. To this end, the bee optimization method was developed. Some typical problems were solved to evaluate the solutions. In addition, in order to prove the algorithm’s efficiency, the results were compared with those of the genetic algorithm in terms of quality, dispersion, uniformity, and runtime. The dispersion index values showed that the bee colony algorithm produces more workable solutions for the exploration and extraction of the feasible region. The uniformity index values and the runtime results also indicated that the genetic algorithm provides shorter runtimes and searches the solution space in a more uniform manner, as compared with the bee colony algorithm. Adulyasak, Y., Cordeau, J.-F. & Jans, R. (2014). Optimization-based adaptive large neighborhood search for the production routing problem. Transportation Science, 48(1), 20-45. Adulyasak, Y., Cordeau, J.-F. & Jans, R. (2015). The production routing problem: A review of formulations and solution algorithms. Computers & Operations Research, 55, 141-152. Deb, K., Pratap, A., Agarwal, S. & Meyarivan, T. (2002). A fast and elitist multiobjective genetic algorithm: NSGA-II. IEEE transactions on evolutionary computation, 6(2), 182-197. Jimenez, M., Arenas, M., Bilbao, A. & Rodr, M. V. (2007). Linear programming with fuzzy parameters: an interactive method resolution. European Journal of Operational Research, 177(3), 1599-1609. Kannan, G., Sasikumar, P. & Devika, K. (2010). A genetic algorithm approach for solving a closed loop supply chain model: A case of battery recycling. Applied Mathematical Modelling, 34(3), 655-670. Naber, S. K., Deree, D. A., Spliet, R. & Van-Den-Heuvel, W. (2015). Allocating CO2 emission to customers on a distribution route. Omega, 54, 191-199. Omidi-Rekavandi, M., Tavakkoli-Moghaddam, R., Ghodratnama, A. & Mehdizadeh, E. (2014). Solving a Novel Closed Loop Supply Chain Network Design Problem by Simulated Annealing. Applied mathematics in Engineering, Management and Technology., 2(3), 404-415. Pham, D., Ghanbarzadeh, A., Koc, E., Otri, S., Rahim, S. & Zaidi, M. The bees algorithm-A novel tool for complex optimisation. Intelligent Production Machines and Systems-2nd I* PROMS Virtual International Conference (3-14 July 2006), (2011). sn. Pishvaee, M. S., Rabbani, M. & Torabi, S. A. (2011). A robust optimization approach to closed-loop supply chain network design under uncertainty. Applied Mathematical Modelling, 35(2), 637-649. Pouralikhani, H., Najmi, H., Yadegari, E. & Mohammadi, E. (2013). A multi-period model for managing used products in green supply chain management under uncertainty. J. Basic Appl. Sci. Res, 3(2), 984-995. Sun, L. & Wang, B. (2015). Robust optimisation approach for vehicle routing problems with uncertainty. Mathematical Problems in Engineering, 2015, 1-8. Taghavifard, M., Sheikh, K. & Shahsavari, A. (2009). Modified Ant Colony Algorithm For The Vehicle Routing Problem With Time Windows. International Journal of Industrial Engineering and Production Management, 20(2), 23-30. Tajik, N., Tavakkoli-moghaddam, R., Vahdani, B. & Meysam Mousavi, S. (2014). A robust optimization approach for pollution routing problem with pickup and delivery under uncertainty. Journal of Manufacturing Systems, 33(2), 277-286. Talaei, M., Moghaddam, B. F., Pishvaee, M. S., Bozorgi-Amiri, A. & Gholamnejad, S. (2016). A robust fuzzy optimization model for carbon-efficient closed-loop supply chain network design problem: a numerical illustration in electronics industry. Journal of Cleaner Production, 113, 662-673. Tavakkoli-moghaddam, R., Azarkish, M. & Sadeghnejad-Barkousaraie, A. (2011). A new hybrid multi-objective Pareto archive PSO algorithm for a bi-objective job shop scheduling problem. Expert Systems with Applications, 38(9), 10812-10821. Tavakkoli-moghaddam, R., Safaie, N., Kah, M. M. O. & Rabbani, M. (2007). A New Capacitated Vehicle Routing Problem with Split Service for Minimizing Fleet Cost by Simulated Annealing. Journal of the Franklin Institute, 344(5), 406-425. Tibben-lembke, R. S. & Rogers, D. S. (2002). Differences between forward and reverse logistics in a retail environment. Supply Chain Management: An International Journal, 7(5), 271-282. Wang, H.-F. & Hsu, H.-W. (2010). A closed-loop logistic model with a spanning-tree based genetic algorithm. Computers & operations research, 37(2), 376-389.